SEATTLE, WA - Mall walking zombies and fairies who wandered by the Apple store on Halloween this year were treated to a bright orange Apple logo patch starting at 4:00 PM on Sunday instead of the typical candy offered by other stores. The front of the Bellevue Square Apple store was packed with mini trick-or-treaters in search of anything merchants had to offer. The small 2"x2" cloth patch came equipped with a peel-off tab and sticky back to be used for instant branding. Apple's treat turned out to be a bigger buzz for parents then it was for kids, with many Dad's spotted wearing the stick-on patch throughout the mall. The little costumed midgets seemed a tad perplexed by the unusual treat which was also the case last year when Apple stores handed out branded magnetic book marks. 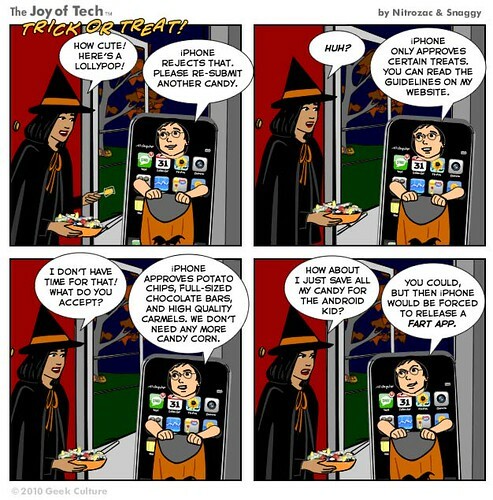 There's a real trick to giving iPhone Halloweeners treats. Do it wrong and you'll get the fart app. STYLE GUIDE: Excuse me miss, is that your hamburger ringing? Here's a great Halloween costume prop idea created using a plastic DVD case, a lot of model magic compound, acrylic paint and an iPhone. The end result is a meaty, do-it-yourself "iBurger" cheeseburger phone used to complete a classic "Juno" costume from the cult film of the same name starring Ellen Page. "I try not to be TV or movie characters for Halloween too often, but when I came up with this idea I couldn't resist." said Karen, the iBurger's creator. "I thought it would be fun to turn my iPhone into the hamburger phone made famous by 'Juno'." Check out step-by-step photos of the iBurger creation on Flickr. Here's the leaked White iPhone 4 promo video Apple does not want you to see. It was made especially for the idiots like me who've been waiting for "a phone that's a different color." Why is the White iPhone 4 still delayed? "Once you go Black, you never go back. Because you don't have that option." *White iPhone 4 delayed until Spring of 2011.
iPhone fanatic John Savio, has created the one iPhone 4 costume to rule them all. The costume took Savio a total of 3 days (40 hours) to complete, just in time for delivering instant Halloween shock and awe. John's upgraded creation from last year features a 40" LED LCD Panel and a jailbroken iPhone 4 that uses a VGA out from the device to control content on the screen. An LED back camera light was added to complete John's amazing iPhone body suit. This epic "GuyPhone 4" costume weighs roughly 75 pounds and uses a mini 12 volt battery with over two hours of usable battery life. Savio is patiently awaiting his personal invitation from Steve Jobs to join the CEO on Halloween. Brilliantly done John! *White iPhone 4 costume delayed until Spring 2011. If you're emotionally bonded to the idea of needing a real tactile keyboard for your iPhone 4 then the TK-421 case might be your fantasy dream date. The nerd squad at Think Geek have come up with an iPhone case that conceals a flip-out tactile keyboard that connects via Bluetooth. Rather than using the iPhone's dock connector, the keyboard is powered by a built-in rechargeable battery that recharges using a USB cable. A big downside here will be the awkwardness of snapping photos while your keyboard is fully extended and trying to keep the keyboard battery charged. Those pesky annoyances may be a buzzkiller for some but not necessarily a deal breaker for the tactile keyboard geeks. Expect to pay $49.99 for the kind of bulky, obsolete, snap-on QWERTY keyboard Apple never intended for iPhone. The TK-421 will start shipping around November 18th and quantities are limited. *Works with any apps including e-mail, web browsing, notes, and calendar. Apple has decided to unveil one of the most sought after and iconic costumes for Macheads right in time for Halloween. Because everyone is dying to be like Steve. 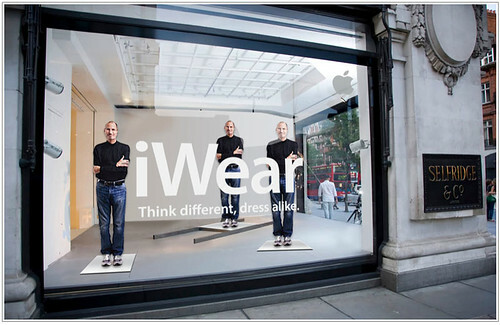 The new Steve Jobs inspired "iWear" clothing line will be sold at select Apple retail stores and Bloomingdale locations through the holiday shopping season. The entire ensemble will be boxed up inside Apple's unique packaging for less than $150. "iWear is the perfect next step for Apple," said San Francisco fashion designer Elam Nikserof. "Steve Jobs has such a massive influence in our daily lives already, it just makes sense for him to dress us too." The new “Be like Steve” print ads are already appearing in major consumer publications with a TV campaign expected to air sooner than later. The epic iWear tag line is Apple brilliance as usual. *White mock-turtleneck currently unavailable for order. The great white iPhone 4 that was originally scheduled to launch in June of 2009, has been officially delayed again by Apple until Spring of 2011. A reason for the painful launch extension was not given by Apple spokesperson Trudy Muller who released a vague statement on Tuesday. "We're sorry to disappoint customers waiting for the white iPhone again," Muller told Reuters. News of a third failed launch comes as a crushing blow to those of us holding out for the White iPhone 4. Apple announced that ol' Whitey would debut later this year after making more manufacturing excuses when the phone did not launch as Apple planned back in July. By the time the coveted device finally gets released, it may only be a few months before iPhone 4.5 or even 5 would be ready for prime time. Let's hope that's not the case. For now, you can choose any iPhone 4 model you like. As long as it's black. Now that Steve Jobs has been given the go ahead to bulldoze his old (dilapidated) historic mansion in Woodside, California, there's finally room for the secret iPod nano home to take its place. While we all anxiously wait to get a sneak peek at official plans for the new Jobsian iHouse, the guys over at Scoopertino have dialed up a multi-touch design of their own. It's a whole new way to Nano.